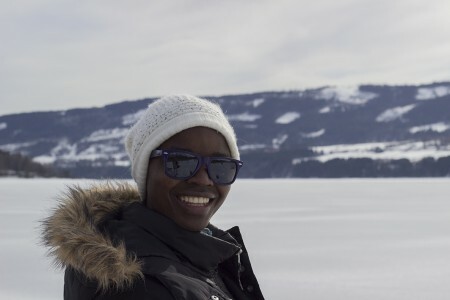 We recently welcomed back our very own Rabbeca Chika and this is what she said about her sport exchange trip to Norway as she narrated her experience for us. “Someone once said ‘sometimes you never know the value of a moment until it becomes a memory’ which is true because looking back, this trip was so rewarding. One thing i noticed is that in Zambia we enjoy camping, even when its winter and we don’t require that much outdoor clothing, whereas in Norway, you have to wear so many layers of clothing which are often heavy. In addition to that, when you go mountain climbing, you carry a heavy backpack with heavy-duty shoes and by the time you reach the top, you’re already dead tired. I enjoyed being involved in child related activities in Norway. It’s great working with children because you can tell them exactly what you want them to do and they follow and are always willing to learn. Activities at Sund folk skole, which was my host organization, involved doing different things with my fellow students. We had different African traditional games and one of these was Nsolo. We recently welcomed back our very own Rabbeca Chika and this is what she said about her sport exchange trip to Norway. She narrated her experience for us. “Someone once said ‘sometimes you never know the value of a moment until it becomes a memory’ which is so true because looking back, this trip was so rewarding. One thing i noticed is that in Zambia we enjoy camping, even when its winter and we don’t require that much outdoor clothing, whereas in Norway, you have to wear so many layers of clothing which are often heavy. In addition to that, when you go mountain climbing, you carry a heavy backpack with heavy-duty shoes and by the time you reach the top, you’re already dead tired. This is nice, do you assist zambian based students to clear there balances.